A group representing small cable firms want Comcast investigated over allegations it’s abusing its power within the industry. The American Cable Association (ACA) represents over 700 small and medium-sized cable operators. ACA has called on US Assistant Attorney General Makan Delrahim to open an investigation looking into Comcast and its practices. “By opening a formal investigation, the DOJ, which has already put Comcast-NBCU on notice, can take the next step to gather facts about the company’s activities and ensure consumers and competition are protected. In particular, ACA claims Comcast has something of a stranglehold on the industry due to owning significant ‘must-have’ local programming including 11 NBC local television stations and seven NBC regional sports networks. 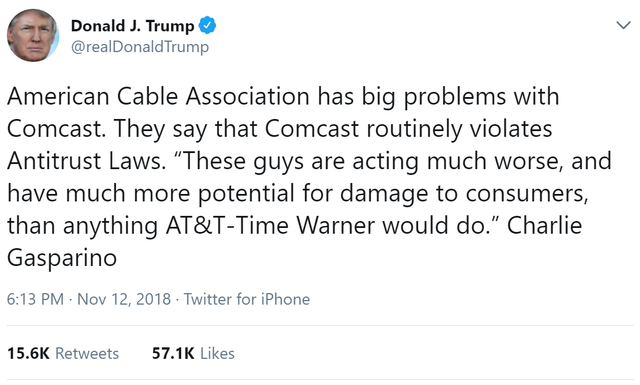 ACA also highlights Comcast is able to offer bundles of video/broadband/telephone throughout its entire footprint, while AT&T-TW is only able to offer a complete bundle of services where AT&T has a wireline presence. Comcast was bound in 2011 to a ‘consent decree’ but that expired back in January. The decree place restrictions on the company but ACA argues the firm continued to show “a willingness to harm rivals” despite it. ACA’s letter indicates the group is more concerned about the potential for Comcast to abuse its power, and the damage it could do, rather than what it has. In the past, however, ACA has provided evidence of questionable practices. In 2017, ACA accused Comcast of forcing smaller cable providers to bundle NBC-owned channels into TV packages to drive up their costs. Comcast has denied any wrongdoing.